R.J. Rushdoony: 00:01 As I pointed out this morning, the Constitution gives us no substantive morality. It does not claim to be a moral code, rather, it presupposes faith and morality on the part of the people. What this means is, as we saw this morning, that the defense of the Republic is not primarily legal and constitutional, but rather religious. If the people of the United States lack Christian faith and morality, the Constitution becomes meaningless. R.J. Rushdoony: 00:53 Nathan Glazer has noticed that major changes have been underway in recent years. The schools have been stripped of even the nominal forms of Christianity, Bible reading, and prayer. Abortion has been legalized. Homosexuality has become a right. Student rights against school discipline have triumphed, and euthanasia is now very close to official recognition. It is being practiced. At the same time, however, evangelical Christianity is witnessing a strong revival. R.J. Rushdoony: 01:44 As a result, Nathan Glazer has written, and I quote, “A true culture [inaudible 00:01:53] now rages in the United States, and the Constitution offers no guidance as to how it may be resolved.” Glazer is right. There is war underway today, warfare against Christianity, and a growing number of Christians are waking up to that fact of total war against them, and are beginning to fight back. Unhappily, too many churches still refuse to admit that we are in a war, a total war in which the obliteration of Christianity is planned. R.J. Rushdoony: 02:39 As we saw this morning, it is possible to appeal to the original intent of the Constitution. It was created by a people who then, and for some generations, were used to a very small amount of civil government, whether on the county, state, or federal levels. Most civil bodies, I indicated, met very briefly once a year, or more often every other year. The major tasks of civil governments, whether on the county, state, or federal level, were minor tasks, inconsequential ones. Society, the family, the church, the school, and the communities, independent agencies provided most of the government. That idea of a bureaucratic and all encompassing state, which governed every sphere of life and thought, was very alien to the United States for almost a century and a half. R.J. Rushdoony: 03:59 The churches were, however, an important part of the existing governmental structure of society. One very liberal Professor of Law at Harvard, Laurence Tribe, has said, and I quote, “At least some evidence exists that for the framers, the establishment clause was intended largely to protect state establishments from national displacement.” The states could establish churches, not that I’m in favor of that. But Christianity was established in the United States. You cannot have any civil government anywhere in the world without an establishment of religion. It may not be Christianity, and usually it’s not, but all laws represent morality. They say certain things are bad and certain things are good. R.J. Rushdoony: 05:09 So it is inescapable that when you enact a law, you are enacting your moral and religious faith. This is why the laws of different countries are different depending on their religious faith. Our laws have one attitude towards human life. Other countries have another. We seek to protect and preserve life, but I’ve talked to people who were born and grew up in the old China. And in the old China, life was seen religiously as a curse. As Buddhists, escape from human existence was the goal. If you saved a person’s life, as some missionaries did, it was then your duty to take care of them for the rest of their life, because you had compelled them to continue living. R.J. Rushdoony: 06:17 You cannot have a structure of law without establishing a religion. That does not mean establishing a church, but Christianity was the establishment in the United States. And men like Justice Joseph Story and court decisions made clear that while we do not recognize Christianity as a salvific doctrine, or as the establishment of a system of doctrine, we recognize it as the source of our laws. Christianity, for most of our history, has had an important part in this country. And the Supreme Court could say, as in the Trinity Case in the ’90s, that this is a Christian nation, not because any doctrinal system was approved of, but because our whole legal structure rested on a Biblical foundation. R.J. Rushdoony: 07:31 But since World War I, and especially since World War II, all this has changed. Senator Moynihan has said, and I quote, “Can we agree then that the great object of the constitutional arrangement we thereupon put in place, was that the government should leave the citizen alone? Thus the thundering prohibition of the Bill of Rights, Congress shall make no law, no soldier shall, no warrant shall.” [inaudible 00:08:10]. That was the problem then. The problem now is that citizens won’t let government alone. They now plunder the state as the state was once thought to plunder them.” I believe Senator Moynihan is overstating it. I do believe there is a power grab underway in Washington, but it is possible because more and more people are demanding more and more from Congress. They want cradle to grave security. They want any number of things. They resent anyone telling them they are not entitled to it. R.J. Rushdoony: 08:56 A few years ago, I wrote a position paper which was quoted, or reproduced in full, by two or three church publications, until they found out it was very unwise to do so. The title was The Trouble With Social Security. And I pointed out how economically it was unsound and doomed to collapse, and that morally it was unsound. The state was taking the place of the family. The parents, when in need, were to be cared for by their children. After all, they had cared for their children when they were not even housebroken. R.J. Rushdoony: 09:42 And I also pointed out that where there were no children or no capacity, Christians in the community had a responsibility, that they once minister to all such needs, and should again. You should have seen the letters I got from people who began by saying, “I want you to know that I’m a Bible-believing Christian, but …” And then they proceeded to tell me how terrible what I had said was. I had quoted the scriptures. “But I don’t want to owe my children for anything.” So we have a problem. Everyone is out to plunder the state, although they don’t call it that. R.J. Rushdoony: 10:38 One result of this change was the 16th Amendment of 1913, which reads in full, “The Congress shall have power to lay and collect taxes on incomes, from whatever source derived, without apportionment among the several States, and without regard to any census or enumeration.” That’s the income tax law. Now, first of all, this is a very remarkable law, because from beginning to end, it has no restricting clause and no limitation on the percentage of income, which can be taxed. In other words, they can impose a tax of 120% on your income. Now if you think that is nonsense, let me remind you that several countries have done exactly that, including Great Britain. R.J. Rushdoony: 11:42 When the Labour Government took over after World War II, they promptly taxed more than 100%, which meant that they wiped out all the wealthy people of England. To pay 100% plus in income taxes, it meant not only did all your income go, but you had to start selling your assets each year in order to pay them, and more of your assets in order to live. That’s why all the biggest states of the nobility today are parts of a National Trust. And the little Lords and Dukes who live there are really tenants, having a right to stay there and to let tourists go through the place so many hours every day. It reached the point where, finally, there were only a bare handful of people in all of Britain who made 40,000 or more a year, none who had any assets to speak of. R.J. Rushdoony: 13:02 Since then, they’ve been moving away from that, to a limited degree, but England was not the only country to pass such a law. The 16th Amendment permits that here. It gives the federal government the power of unlimited income taxation, and we have not yet seen the worst. Then second, although conservatives like to say that, at least some of them, that the 16th Amendment was slipped by while nobody was really noticing, it was really a very popular law, because most of the people thought it was going to take money away from millionaires. And when someone in Congress got up and said, “Look, it may hit you and it may hit me,” they laughed. They didn’t think that would ever be possible. But there was a strongly socialist temper in the United States in 1913, and the Amendment was seen as a “soak the rich” measure. Well, you’re now one of those being soaked, and so am I. And we have not yet seen the worst. Now, that’s a part of the Constitution. R.J. Rushdoony: 14:35 Then third, a very serious error on the part of Christian conservatives is to read the Constitution like the Bible. That is as though it had an unchanging meaning. Now, the original intent and meaning of the Scripture always prevails. What God says in Genesis is never to be read except as it reads. But the original intent of the Constitution prevails only until an Amendment alters it. The Constitution is like a will. The last codicil on a will governs everything that precedes it, so that if you add something to your will, you alter the meaning of all that precedes it, because this is the last word from you. So the most recent word in the Constitution governs everything that precedes it. R.J. Rushdoony: 15:44 This is why when Deukmejian was Attorney General, and I tangled with him, and I think he was dead wrong, he insisted that the 16th Amendment nullified the exemption of churches from taxation and control. He said the churches only have a statutory exemption, that is by a current law, not a constitutional one. They have no legal right. He was not being original in that decision, which was some 25 or 40 pages long. He was simply citing what other state attorney generals and what some courts had said. And we are moving in that direction of saying the 1st Amendment has been wiped out by the 16th. And I had heard judges, state and federal judges, say they do not want to hear the 1st Amendment cited or quoted in the trial before them. Only the most recent decision of the Supreme Court will govern them. R.J. Rushdoony: 18:14 For us, this means that the various Amendments, and the uses made of them, are more important in practice than the original constitution itself. It was in the mid 1930s that Justice James McReynolds, in a dissenting opinion, wrote and I quote, “As far as the Constitution, it does not seem too much to say that it is gone.” If this is true, it is because the people themselves are gone. To put one’s hope in law, among the lawless people, is folly. R.J. Rushdoony: 19:05 We saw this morning that the Yalta Treaty legalized slavery. We can add fifth, that the 6th Amendment does also. Slavery means the ownership and the labor of others. It is involuntary servitude according to the Constitution. The requirement that we provide freely to the Internal Revenue Service our services in keeping books on employees for the IRS and on income is involuntary servitude according to the plain reading of the 13th Amendment. Because of the 16th Amendment, we have to do this for ourselves. We have to submit our records to testify against ourselves, and it won’t do to plead the 5th Amendment on that, because the 16th Amendment has nullified that in terms of your financial records, because unrestricted power has been given to Congress to lay and collect taxes on incomes. R.J. Rushdoony: 20:19 We are now compelled to testify ourselves, and to supply all demanded records to the IRS. This very clearly invalidates the 5th Amendment provision that no person shall be compelled in any criminal case to be a witness against himself. This is all soon validated by Congress. Otto Scott of our staff has written on Congress as a Star Chamber. Remember in the days of 17th century England when the Star Chamber under the kings could haul any man in, and compel him to testify, and hold him a prisoner indefinitely. Congress now can do the same. It can compel you to testify against yourself. There are similar developments in some of the grand jury hearings as well. R.J. Rushdoony: 21:37 Now on the surface, Christianity is at a unique high in its importance in the United States, according to all the polls. Surveys tell us that 86% of Americans declare that their religious beliefs are very important or fairly important to them. Europe shows much lower percentages. Add to this that 77% of Americans declare that they believe in the full authority of the Bible, that it is the infallible Word of God. Oh, this sounds very encouraging, very wonderful, but how much truth is there to it? The same survey tells us that of all these people who profess to be born again, Bible-believing Christians, only 42% can name the four Gospels, or identify the author of the Sermon on the Mount. The churches, as a result, are impotent. R.J. Rushdoony: 22:56 In 1940, Roscoe Pound, one of the great humanistic legal minds of this country, was in Claremont lecturing at the college. I quoted him earlier when he said that law and courts were giving place to the power of the bureaucracy. In 1940, he spoke also of the growling disappearance from law of the moral concept of what ought to be. In other words, that homosexuality is wrong because God declares it to be so. Now it’s right because instead of what ought to be, we are told what is must prevail. Why not in terms of what is, legalize murder. It’s very prevalent. Or theft, it’s very prevalent. 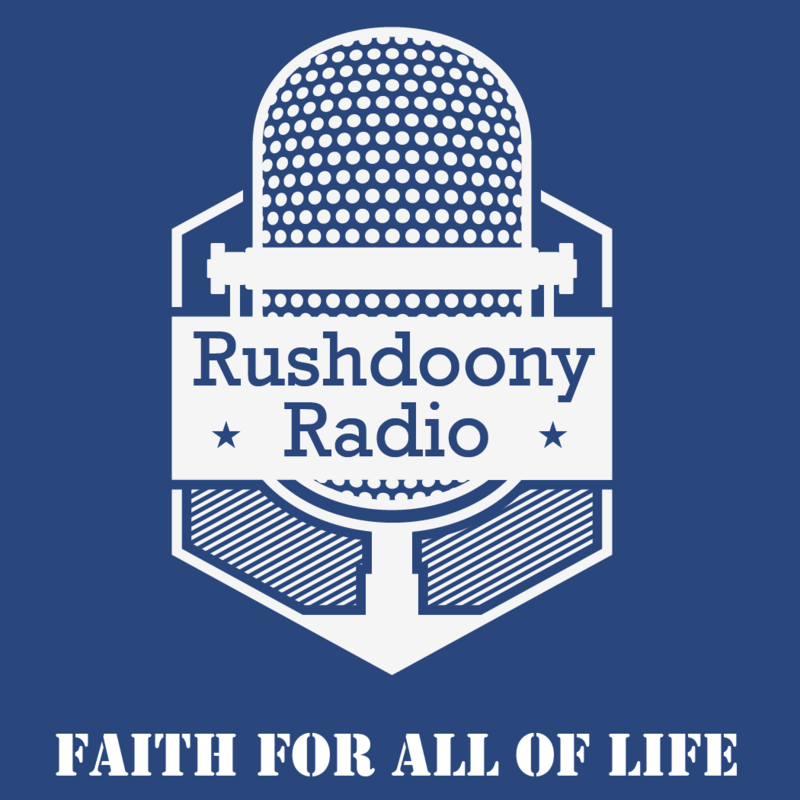 R.J. Rushdoony: 24:06 A few years ago when John Tunney was Senator from California to Washington, DC, at the Disneyland Hotel, a group of pro-life people collared him. And they wanted to know why, he as a Catholic, was voting pro-choice, when abortion, they said, is immoral. And he said, “No, it is not immoral.” “Why not?” “Because it is legal.” And they asked him, “If theft were legalized tomorrow, would you declare it to be moral?” And he said, “Of course.” John Tunney’s opinions are increasingly more common place. The doctrine of what ought to be is being removed from law in favor of what is. In fact, Roscoe Pound has said, “In the lectures of 1940, Freudian psychology, relativism, economic determinism, and other like concepts, have replaced moral mandates as a source of law.” That was 1940. R.J. Rushdoony: 25:40 Since then, the erosion has been very dramatic and is becoming more rapid. As I have said several times, the Constitution does not give us a substantive morality, no moral code. The substantive morality of the United States, from its earliest years, has come from the Bible. And the Bible had a place in the courts. It was law. It governed men and courts. Althouth Pound did not speak as a Christian, we as Christians could agree with him when he said, and I quote, “And jurisprudence, we are dealing ultimately with what ought to be.” So law represents a moral standard. R.J. Rushdoony: 26:48 The very fact that we have laws tell us these are things which people want to do. They want to kill. They want to steal. They want you to do these lawless things. But we have a duty under God to restrain them, because civilization will then collapse if we do not. If Christians do not provide the moral imperative of God’s law, the humanist will apply the imperative of relativism. Our basic battle was/is to wake up the churches, to overcome their Antinomianism, to make clear that God’s law must be binding. R.J. Rushdoony: 27:48 The procedural morality of the Constitution gives us the terms of office, the conduct of courts, of arrests, of bailment, of witnesses, and so on. It does not define for us the meaning of life, or the use of sexuality, the nature of the family, the character of education, the sanctity of life, and so on and on. All the elements of life and society, which at long provide the good life, are derived from religion, from the Bible. The Constitution can restore nothing, nor can it make the courts or the people just. That is not its task. It is the task of the Christian community. The Constitution is a remarkable document. It is a major event in history. It was only so because of people, however simple they were, formed it and were to a degree governed by the Word of God and the Holy Spirit. R.J. Rushdoony: 29:08 If tomorrow the Constitution and its original intent were made the governing and supreme law of Hell, Hell would not be changed a bit. It would still be Hell. And neither Hell, nor its congress, nor its courts, nor its administration, nor its supreme ruler, the devil, would be improved an iota. Whether in hell or the United States, a return to the Constitution, per se, is meaningless. After all, the Bible tells us very clearly, “Except the Lord build the house, they labor in vain that build it.” Our problem today is that we have so many experts who have any number of solutions to the problems of the world, solutions derived from sociology, or law, or psychology, or economics, from one discipline or another, some good, some bad. R.J. Rushdoony: 30:37 And the churches and Christians are too prone to believe that, “Well, if we elect these people, or this party, or apply these ideas, we can restore our country.” And that’s an illusion. It cannot be done apart from Christ. “Except the Lord build the house, they labor in vain that Build it.” The Constitution. As human documents go, is a very remarkable one. The Bible is the very Word of God, but neither can do anything on a shelf when the people are sinful. The change must begin there. Now, in our final session before we have questions and answers, I’d like to deal with change.